On November 28, 2004, God blessed us with a beautiful angel Treazure Ja’net Powell. Throughout her 14 years on earth, she had such a humble spirit whose smile always brightened, enlightened, and positively impacted everyone’s life encountered. She was a lover of Christ, a member of Destiny Church Dothan, and a huge blessing to us all. 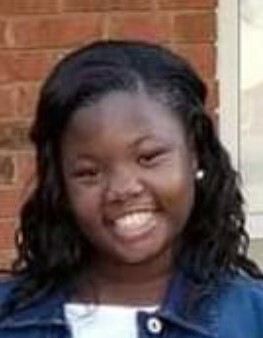 Treazure attended Beverlye Magnet School where she was an honor student and gifted scholar. She loved playing the clarinet in the BMS band. She was loved and adored by her student peers as well as teachers. She was active in the community. Treazure has played softball since the age of 4 with the City of Dothan Leisure Services. She was a junior staff member at the Boys and Girls Club of the Wiregrass. She was member of the Destiny Church Youth Department. She was also a former dancer with the Onyx Stars. Treazure touched the lives of young and old in a manner that can only be described as that of an Angel on Earth. She was preceded in death by her brother: Tyler Earnest Powell; grandmother: Valonia Wymes Powell; grandfathers: Lonnie Shambray and John T. Powell, Sr., and aunt, Jeanette Powell Ardis. She leaves to cherish her memories: her loving parents: Earnest and Monica Powell; sister: Teniyah Smith; grandmother: Evelyn Lewis; aunts and uncles: Tammy (Shedrick) Jackson of Macon, Georgia, Stephania (Stanley)Rolley of Ozark, Alabama, Alicia (Robert) Burns of Colorado Springs, Colorado, Veronica(Ronald) Shambray of Hampton, Virginia, Annie(Eddie)West, Eddie Lee Powell of Columbia, Alabama, Valonia (Tracy) Womack of Albany, Georgia, Keno (Stephanie) McCoy of Douglasville, Georgia, John (Shelia) Powell, Doffie (Karen)Powell, Edward Powell of Dothan, Alabama; other relatives, classmates and friends.